Ming Taizu means “Grand Progenitor of the Ming”; this was the posthumous title for Zhu Yuanzhang (Chu Yuan-chang), who founded the Ming dynasty (1368–1644) in China. He was the second commoner to found a Chinese dynasty, the first being Liu Bang (Liu Pang), founder of the Han dynasty (220 b.c.e.–220 c.e.). The Ming founder drove out the Mongols who had ruled China oppressively for a century and restored Chinese self-confidence, economic prosperity, and international prestige that equaled that of the previous great Han dynasty and Tang (T’ang) dynasty (618–909). Zhu Yuanzhang was the son of poor tenant farmers from Anhui province in southern China. Mongol misrule and natural disasters reduced the area to penury and a plague killed most of his family. Left an orphan he joined a Buddhist monastery, and when the monastery ran out of food, he went out begging, then joined a rebel movement called the Red Turbans, one of many that emerged in southern China as Mongol power disintegrated. His ability led to quick promotions and marriage to the leader’s daughter (née Ma). She became his key adviser and mother to his successors. While other rebels looted, Zhu captured Nanjing (Nanking), a key city south of the Yangzi (Yangtze) River in 1356; set up a rudimentary government; and then subdued the entire Yangzi valley by 1367. Marching north he captured the Yuan capital Dadu (T’a-tu) in 1368, ending the Yuan dynasty (1279–1368). Zhu assumed the reign name of Emperor Hongwu (Hung-wu), which means “bounteous martial emperor” (r. 1368–98). By 1388 Ming forces had conquered all southern and southwestern China, Inner Mongolia, Manchuria, and Xinjiang (Sinkiang). Remnant Mongols were driven beyond Karakorum to the shores of Lake Baikal. Korea, many oasis states in Central Asia, and some Southeast Asian states submitted as vassals. 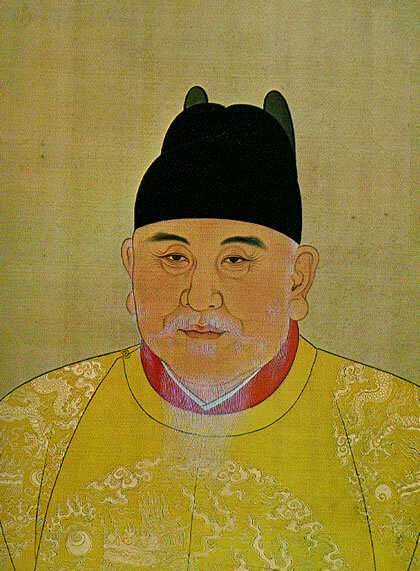 Taizu built up a new centralized government on the Tang model, reestablished the examination system to recruit officials, and encouraged and subsidized local education to nurture talented young men for government service. He also proscribed eunuchs’ gaining political influence. He earned popular gratitude by freeing millions of Chinese enslaved by Mongols, confiscating large estates belonging to Mongols and their collaborators, and granting land to the landless. The people were also given free tools and seeds and tax remission to rebuild a neglected rural economy, especially in devastated northern China. Taizu was also suspicious and insecure, and after Empress Ma’s death in 1382, increasingly paranoid and cruel. He ruthlessly persecuted and purged many officials who had helped him gain power. Taizu was predeceased by his eldest son and crown prince, and according to Chinese practice, passed the throne to a youth, the son of the crown prince. This action would trigger a war of succession.